Crip the Lit (#CripTheLit) was formed in 2016 in Wellington to provide a space for Deaf and disabled writers to tell their stories within mainstream New Zealand literature and writing generally. It seeks to give a platform to and publicise the work of disabled writers, and to provide authentic and diverse portrayals of disability. The first CriptheLit event was held in 2016 as part of Wellington’s annual LitCrawl (whereby numerous literary events are held around the city in one weekend) at the disability-friendly CQ Hotel. That occasion featured memoir writing and subsequent events have included readings and a debate. 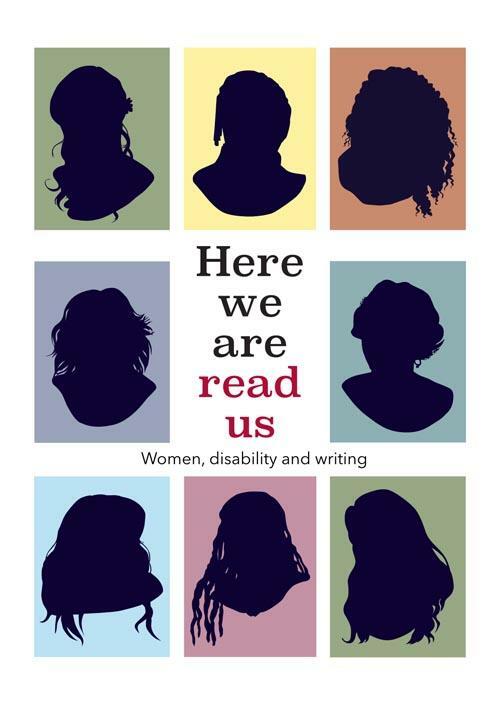 Here we are, read us is a recently launched booklet featuring eight women including writers of fiction, poetry, essays and blogs. In a few succinct words each touches on their work and motivations, accompanied by a hand-drawn and themed portrait. The writers are Tusiata Avia, Steff Green, Helen Vivienne Fletcher, Charlotte Simmonds, Michele Leggott, Trish Harris and Te Awhina Arahanga. Last listed is Robin Hyde, reclaimed as a disabled writer by joint editor and CripTheLit founder Robyn Hunt. Some mention the influence of their impairment on their lives and writing. For example, joint editor Trish Harris’s piece begins: "I am a part-time crane operator. Every time I unload my power chair from the car, the tilt of the ground affects the swing and balance of the hoisted chair." This free publication leads the way in accessibility over multiple formats including in large print, Braille, as an e-book and audio file - all freely available within a Creative Commons licence. My only niggle is that I would have liked to have some sort of bibliography or reading list of author works to follow up with. But that’s why we have libraries. It has been funded by numerous organisations and supported by Arts Access Aotearoa. This link tells you how you can get a copy. About a year ago, my younger son asked me if I'd like to play a video game. I'm really not a gamer, but he wanted me to see it and he was happy to make it easy for me by working the controls so we could concentrate on the content. It was Finji's brilliant interactive narrative Night in the Woods, which tells the story of college dropout Mae Borowski as she returns to her hometown and tries to pick up her old life. It's a story of millenial drift and rustbelt decay; subtle, political and and sometimes deeply touching. I really liked it and I started to care about the characters and even got half-competent with the controls. All the way, my son wanted to know what I thought of it. We talked about what I made of the game's themes and when we finally finished up after a couple of weeks' gameplay, he told me why he'd been so keen for me to play. "I relate to Mae," he said. "You know, early twenties, stuff in the past, no direction in life." I suddenly realised that he'd involved me in the game as a way of telling me something. And of course he'd employed gameplay to do it. Since we had to pull him out of school at the age of 12, video gaming has been his culture. His long discussions with his former tutor, Matthew Dentith PhD, often started with something from a video game: morality, war, classical mythology. He has a deep understanding of video games and it's both technical and aesthetic. It shows in the occasional expert-level game reviews he writes. He's highly intelligent, but school, the human noise of it, had him in more or less constant fight-or-flight mode. His skin would be hot to the touch most of the time. It must have been horrible. What a way to live as a child. Since we pulled him out of a school system that couldn't offer what he needed, his great achievement has been to create an environment around him that's devoid of the anxiogenic elements that were making his life hell. This means he doesn't leave the house a lot. But, over the long haul, he's changed from the distressed kid who had near-daily violent meltdowns into a polite, thoughtful young man. I really admire what he's done. But he knows he has to get on with it. The question is: get on with what? His affinity for gaming and facility for computers has led us down a lot of blind alleys. Something would seem promising and he'd pull the pin on it, as part of the same anxiolytic defence system he's developed to make his life bearable. Maybe there was some fear of success in there too, I don't know. But something has happened in the past year: Warhammer. He's begun to collect and, more importantly, paint Warhammer figures. His painting is fine, subtle and brilliant and, it seems, much more important than the actual board gaming. It's revealed something in him that's been missing over the years – the ability to plan and work over time. It's also a form of character creation and development. When we tried him on a digital design course, he had no trouble with the software but got frustrated because it was going to take so long to get to the part he was interested in – the characters. But mostly, of course, it's a chance to do something in real space. We've discussed it and it might be the way forward. He was pretty interested in the news that there is an actual job in the film industry called "model painter", but also in simply learning more skills of this kind. Things might have been different had I been a different sort of dad, but outside the kitchen, I'm not well wired to work with my hands. I've partly written this post to make the point that not every autistic person, even if they're good with computers, is automatically a coder. I often think that's not well understood. But also because we're wondering about introductory workshop courses, setbuilding, maker groups and the like – or even just connections with grown-up geeks who like to do that kind of thing. He has plenty of online friends, they voice-chat across oceans and that's all good. But we're looking for real things in real space, and new skills around them. I don't really know where to start, but I'm open to offers and suggestions. And if it does work out, well, I'll thank Mae Borowski. I hope that, in some virtual future off the end of Night in the Woods' narrative, she's doing okay now. NB: Feel free to comment here, but I'm also keen and happy to get emails. Just click the little envelope icon below the post. In the 1960s a New Zealand woman gave birth to a baby boy with Down Syndrome. There was no celebration at the birth and the family GP told the parents that the best thing would be to put the baby into an institution where he would be looked after, to forget about him, and try for a "normal" baby as soon as possible. He warned that the family would be shamed by the baby as it indicated faulty genes and other family members might not find partners if there was a risk of producing a "mentally defective" child. That was the insidious conspiracy theory of eugenics. The mother loved her son and wanted to keep him. But one day the family doctor and a staff member from an institution came to take the baby. The mother was instructed not to visit for at least two years to help her forget about him. Of course she never did, but visiting him was difficult and several years later she heard that he had died. That child was one of thousands of children coerced from their families and communities and sent to one of several psychopaedic or psychiatric institutions across New Zealand in the middle decades of the 20th century. There were so many that the profession of specialist psychopaedic nurse (nurses for children with intellectual or learning disability or other impairments in the institutions) was a New Zealand invention in the 1960s. Survivor stories such as in Robert Martin’s 2014 biography, Becoming a Person recall various types of physical, emotional, sexual, medical, spiritual, cultural abuse and neglect. The 2017 report for the Human Rights Commission called Institutions are places of abuse: the experiences of disabled children and adults in State carewidens the picture. Although there were some kind staff, clothing, housing and routines were communal and individual identities denied. Children were sometimes shifted around institutions or in or out of foster care without understanding why. Documentary-maker Gerard Smyth talked to several former residents of Templeton Hospital for his 2004 documentary, Out of Sight out of Mind who were trying to make sense of their decades of institutionalisation. Their crime was having a disability or learning impairment or just being poor. Some were bussed there as pre-schoolers and didn’t leave until they were in their 60s. When the institutions started to empty – the last was Kimberley in 2004 –some families discovered a new or missing member. Other survivors shifted into residential care in the community without family or identity apart from sparse notes in their institutional files. This historic abuse by the State and its agencies affected thousands of individuals and families. There are several categories of victims: the disabled children; the mothers and fathers; family members who were denied a sibling; clinicians, staff and policy people who believed they were doing their best (or just following rules); a New Zealand which let it happen. Will that elderly mother of that stolen child know to register with the Commission and get a chance to be heard? I’m not sure how the old lost men in their group homes will find their way to the flash offices in Lambton Quay to tell their stories. But I hope they do. Dr Margaret Cruickshank, New Zealand’s first registered woman doctor, has saintly status in our family. She died a century ago on 28 November 1918 in the influenza epidemic. Doctors were in short supply during the war and she had worked around the clock helping influenza victims until it took her too. Born in 1873, at 20 she was too young to vote in the first women’s suffrage election on 28 November 1893 (another anniversary to mark this month) when the voting age was 21. After becoming the second New Zealand woman to complete medical school, Margaret joined a practice in the Canterbury town of Waimate. My grandparents asked her to be the godmother to their second daughter, my mother, born there in 1917. 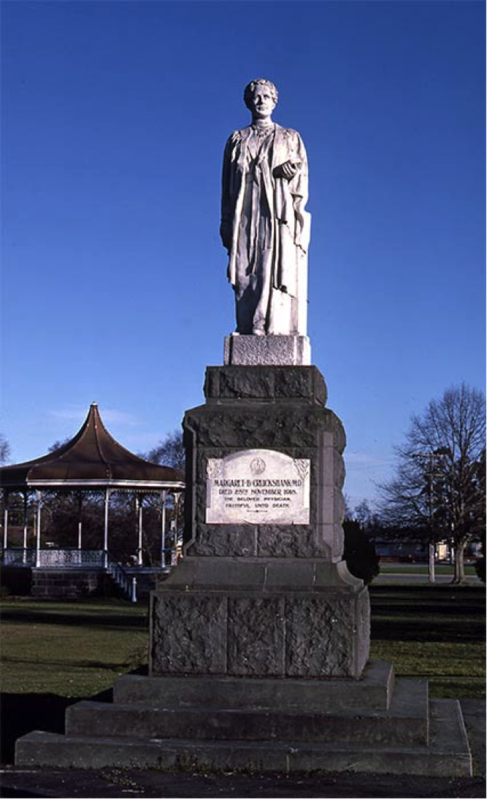 But 18 months later she died helping others and in 1923 the citizens of Waimate erected a statue to honour her. I have a letter she wrote about her Christian faith and how it could be tested at times. She never married. I have a tenuous connection to another flu story. In early November 1918 the SS Talune transported the flu from Auckland to Samoa, Fiji and Tonga – with disastrous effects. Even though there was sickness on board only American Samoa refused the ship entry. In Samoa, it collected a young family on their way to live in Wellington. The father was a member of the NZ Expeditionary Force which in 1914 had claimed Western Samoa for New Zealand from Germany; the mother was a local woman of Samoan, Tongan and German heritage. She was pregnant with her second child and her baby daughter was 14 months old. What a terrible trip it must have been as most on board got sick including the crew and the father. By the time the family settled in Wellington most of the mother’s family had died along with a significant proportion of the Samoan population. Grief and anger towards New Zealand and its neglectful governance fostered the growth of the Mau independence movement and led to the 1929 Black Saturday deaths. In 2002 Prime Minister Helen Clark apologised to Samoa. Wellington was badly affected in what historian Geoffrey Rice calls Black November. Deaths were caused by pneumonia and cynanosis (lack of oxygen) which turned victims blue and after death darkened sometimes to black. Profuse bleeding was common. Bodies quickly decomposed requiring hasty burial. In Wellington’s Karori Cemetery there are about 660 identified flu deaths in November and December 1918 and many more died throughout the Wellington region. At its height, dozens of people died each day. It is estimated up to 50% of the population could have been infected although most survived and many had only mild symptoms. Altogether, about 9000 people died in New Zealand in only eight weeks, compared to 18,000 deaths of New Zealanders in 4 years of war. Future Prime Minister Peter Fraser was elected in a byelection in Wellington Central on October 3, 1918. Along with several of his Labour colleagues he had recently spent time in jail for opposing conscription for the capitalist war. Through his union networks he began to hear about illness on the returning troop ships that was much worse than the regular annual influenza. Prime Minister Massey and his Deputy Ward returned from Britain via San Francisco on the Niagaraon 12 October and although there were sick people on board the ship was not quarantined. It is now thought that the more virulent flu strain was already here and travelling around the country’s rail networks with returning troops. But it took the conservative government several precious weeks to take it seriously. Flu was not considered a notifiable disease until early November and no limits were placed on the Armistice celebrations, which helped intensify its spread. However, soon the city streets were empty as shops and offices closed, people refrained from social contact and sickness took over. Politics played a role in Wellington’s response. Mayor John Luke was also the Government MP for Wellington North. Peter Fraser’s Labour colleague Harry Holland had recently stood against him for the seat. There was likely some conflict between Government and opposition. As a member of the Government, Luke had to accept the cautious response from his Minister of Health. Fraser was an activist new MP in an electorate which included severe areas of deprivation such as Te Aro flat with poor quality crowded housing, poverty and rapidly spreading illness. He wanted to get going. Committees including the Mayor and a grid system for the city with makeshift hospitals and support systems were soon established. Peter Fraser put his personal phone number in the papers for anyone to ring who needed help. He and his volunteers went door to door bringing food, helping with cleaning or child care (as many parents were ill or died) and even carrying out bodies. Medications were expensive, so Fraser arranged for people to get what they needed with the bill sent to the Government. Later he persuaded the Government to bring in a pension for flu widows similar to the financial support war widows received. During the epidemic both Holland and Fraser, from the left of the young Labour Party, caught the flu but recovered, while the more conservative leader of the Labour Party and MP for Wellington South, Alfred Hindmarsh, died. The resulting Labour Party was more comfortably socialist. Fraser was deeply affected by his experiences, but it took 20 years before a newly elected Labour government could change laws to improve housing, health and welfare. Where did this virulent flu come from? The latest thinking is that this new strain evolved in Kansas early in 1918 and spread to Britain and Europe with the US troops going to war. Servicemen then took it home to their own countries at the end of the war. It was unusual in that November marked the height of the epidemic in both northern and southern hemispheres, when the regular New Zealand flu season follows six months behind the European winter. Another unusual aspect was that younger adults were most likely to get sick and die rather than the children and elderly who were most at risk from epidemics – the average death was a male aged 28. Māori and other indigenous populations were particularly badly affected, with the Māori death rate much higher than non-Māori. Australia was less affected than New Zealand as more quarantine measures were implemented against arriving ships. Understanding of illness and infection developed during the epidemic. The general theory until then was that flu came from ‘miasma’ or fumes from sewage or objects, rather than from other people. With few medications available, hydration, cooling through sponging or aspirin (if available), isolation and fresh air became the main interventions. Zinc spraying was a popular but probably ineffective preventative. Treatment required intensive nursing in crowded makeshift hospitals and not surprisingly many front line workers died. The work of volunteers was vital. Margaret Cruickshank’s statue is one of very few memorials to those who worked or died in the influenza epidemic of a century ago, while WW1 memorials are numerous. I hear there is a plan for a plaque at Wellington’s Pukeahu National War Memorial Park naming the dead. I hope so. Perhaps a more significant way to honour those who died is to be well prepared to rebuff the next pandemic.